Ask anyone where to find cronuts in Sydney, and their instant answer is always Brewtown. Capitalising on the cronut trend, Brewtown was one of the early adopters and quickly became THE place to go for your cronut, or should we say BREWnut fix. 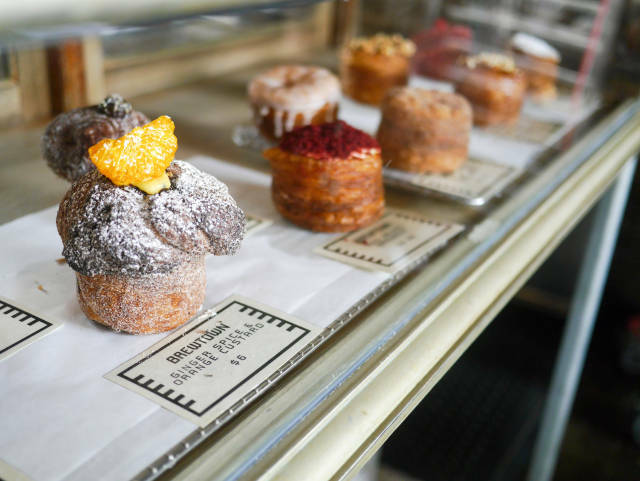 While the cronut was originally created by Dominique Ansel and his team at the Dominique Ansel Bakery in New York City, the half-donut, half-croissant has taken the world by storm, and Brewtown lead the charge in Sydney. The launch of brewnuts, on the back of an international social media storm with every man and his dog desperate to try the delicious new creation, meant Brewtown was quickly overrun with orders. Brewtown named their cronuts 'Brewnuts' and added their own unique and delicious flavours, such as strawberry and lavender or blood orange with chocolate cream filling. The key lime cruffin (croissant-muffin hybrid) topped with torched meringue is another cult favourite. Brewtown bakes these in house in their Newtown bakery, and roasts coffee which is now supplied wholesale to other cafes. Being one of the first to wholesale cronuts while the craze was taking social media by storm meant Brewtown, already making a splash for its in-house bakery, roastery and exceptional menu, became a household name. Now in three locations, Brewtown is no longer Brewtown Newtown, but the successful cafe has outposts in Surry Hills and Cammeray - all equally popular. Known for an innovative menu with local, seasonal and high quality produce, few items are talked about more than Brewnuts and cruffins. When Brewtown started wholesaling Brewnuts, their orders skyrocketed, and taking an order over the phone and jotting it on a piece of paper was no longer enough. That was when they knew they needed a better way to manage and fulfil orders, and streamline production. Retailers wanting to sell Brewnuts in their cafes would simply order through the Ordermentum app (which would send a text reminder so they knew to order before cutoff- with a simple tap to confirm) and the bakers would have an instant list of all orders, to be able to quickly calculate ingredients, know exactly how much to produce, completely eliminate any ordering errors (lost bits of paper from someone calling on the phone) and focus on crafting a great product. Not to mention the instant packing and delivery reports to get those fresh cronuts out the door right away! "We realised that we HAD to find a solution, and Ordermentum was perfect for that."